China Terrified Of A Potential Trump Presidency, Starts Issuing "Warnings" To The U.S.
China Terrified Of A Potential Trump Presidency, Starts Issuing 'Warnings' To The U.S.
After GOP presidential hopeful Donald Trump took his third consecutive primary/caucus win in Nevada on Tuesday, the reality of a potential Trump presidency not only rippled through the political establishment in the U.S., but has terrified China to the point where they have started issuing warnings to the U.S.
As noted in my recent article "China Has Won The Global Game Of Monopoly And Ended Up With Park Avenue - And Everything Else", in 2009 China demanded a "guarantee of safety" of its American bonds to which the Washington Post specifically noted the comments were being used as "leverage to tell the U.S. to back off on currency policy and trade policy." Via The Beacon article quoted above from February 24, 2016, we see the "Obama administration has adopted conciliatory policies toward China on trade and currency issues." The reason a potential Trump presidency has China concerned is stated on Trumps website under the "U.S. - China Trade Reform" section, where both the currency issues and trade policies are addressed. America has always been a trading nation. Under the Trump administration trade will flourish. However, for free trade to bring prosperity to America, it must also be fair trade. Our goal is not protectionism but accountability. America fully opened its markets to China but China has not reciprocated. 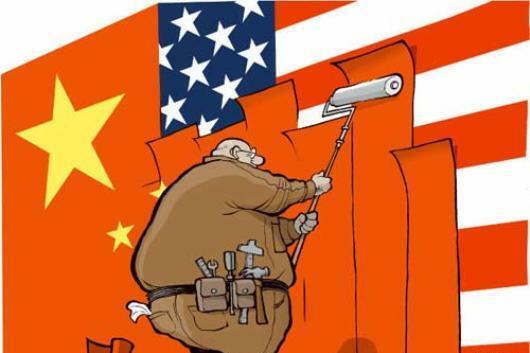 Its Great Wall of Protectionism uses unlawful tariff and non-tariff barriers to keep American companies out of China and to tilt the playing field in their favor. As we have previously reported the U.S. trade deficit with China was $365.7 billion in 2015, breaking a new record from the previous $343 billion deficit of 2014. U.S. exports to China were only $116.2 billion while imports from China hit a new record of $481.9 billion. China understands that should Trump become the next President of the United States and should he follow through on his plans to force fair trade between China and the U.S., we would not be seeing fully loaded import ships into the U.S. without an equal number of fully loaded, rather than empty, ships leaving the U.S. Whether one is a Trump supporter or not, his points about China beating us at every turn are valid and every single candidate for presidency should be addressing the trade deficit as well as China's currency manipulation. China is rising to the top on the backs of Americans, while Americans are suffering record poverty levels, record welfare needs and record numbers of people not even in the labor force anymore. Another consequence of our current "conciliatory" policies toward China, is found in another interesting and disturbing pattern highlighted by the AP, showing that "Beijing is the new "Billionaire Capital of the World." Beijing took the title from New York after minting 32 new billionaires last year, while New York gained four. The US trade deficit with China hit a critical milestone in 2015. It now stands at a mind-numbing $1 billion a day, and that $365 billion annual trade deficit continues to rise with the lift of China’s illegal export subsidies, sweatshop labor, pollution havens, and undervalued currency. The failure to understand that America’s Chinese import dependence has now reached critical mass as a national security issue comes from the very mind-numbing magnitude of the numbers involved. One day’s worth of China’s trade surplus with the US buys 1,000 new cruise missiles that Beijing can point at Taipei or 100 anti-ship ballistic missiles to target American carriers. one week’s worth of China’s trade surplus finances the construction of at least three new Chinese aircraft carriers to patrol the South China Sea and Indian Ocean or 20 new Yuan class diesel electric submarines to lay in wait for Japanese destroyers or American aircraft carrier strike groups. And Beijing can pay for its entire annual defense budget with a mere five months of what American consumers contribute to Beijing’s imperial fisc.